They great people like a King and Queen. The wait was just 3 minutes. I like them they very professional. Loved Dr. Wakily! He was gentle and thorough, paying close attention during to how comfortable I was during me recent emergencyroot canal. The office staff here is fantastic, too. 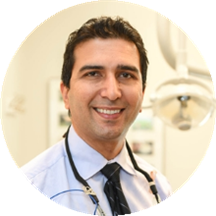 Originally from Westbury, NY where he attended Hayward High School, Dr. Wakily headed west for college and dental school, attending the University of California at Berkeley and University of the Pacific Dental School. He is a certified Invisalign provider and has implant and surgical training. As a dentist, Dr. Wakily appreciates being able to take care of his patients and ease their fears about dentistry. His wife is a medical doctor and they have two children. He enjoys spending time with his family and and reading. One interesting fact about Dr. Wakily: He spent 20 years living, learning and working in California and then decided to move to Long Island because his wife is from here. Staff & the doc was great! I got a hand-written thank you card. Will def go back.